They'll be out before Elder Scrolls VI. The developers at Bethesda are busy beavers. 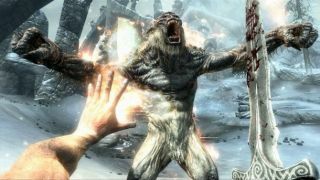 They've got at least three games in the pipeline, one of which, of course, is The Elder Scrolls VI/6/Six/Revengeance. That's going to be a long way off; however, Bethesda's Todd Howard confirmed the existence of two other projects that we'll likely hear about before TES6 is properly announced. Now, a few more details about those games have come to light, courtesy, once again, of IGN. Bethesda's Pete Hines reveals that the games are going to be as big as an Elder Scrolls or Fallout, and that they'll be out before Elder Scrolls VI. In reference to Todd Howard's comments, Hines stated that "I'm just making sure folks understand, like, that doesn’t mean he’s going to spit out a DLC and another DLC and we’re head faking. Like, I need folks to understand that we’re talking about big games like a Skyrim and a Fallout 4 and a Fallout 3 and those don’t just happen". "The studio has two major projects, two major games that they are planning on doing before they get to an Elder Scrolls 6." BUT WHAT ARE THE GAMES, HINES? TELL US ABOUT THE GAMES. What do you reckon/hope Bethesda is working on?